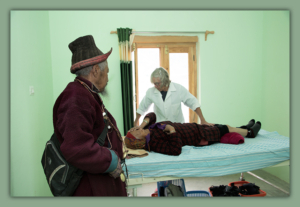 To implement sustainable programs that improve access to traditional and allopathic medical care for the people of Zanskar. 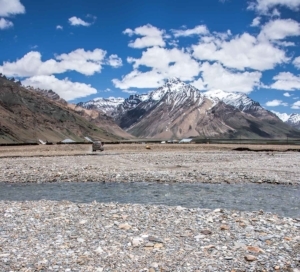 The Zanskar Valley in India is one of the most remote inhabited regions of the world. His Holiness the Dalai Lama has said ”this is the last remaining authentic Buddhist culture.” In this 12,000 foot high Himalayan Valley, surrounded by 24,000 foot glacial peaks, the people are isolated from the rest of the world each winter as the only road in and out is buried in snow and temperatures drop to -40° F. Every year, as the cold settles in, the healthcare needs become more critical. 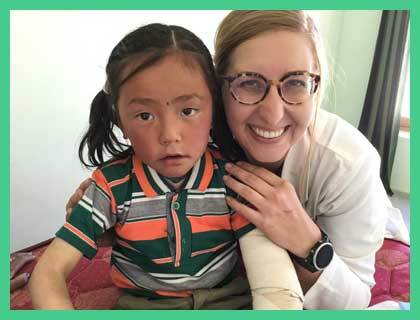 Hands On Global is providing yearly medical camps based at the Sowa Rigpa Hospital in Padum. General medical screening and basic treatment, including a women health clinic, is provided by both allopathic and integrative medical professionals and support staff. The team works with local translators. Education of the local health care workers is a major focus of the camp in collaboration with traditional Amchis (indigenous healers). 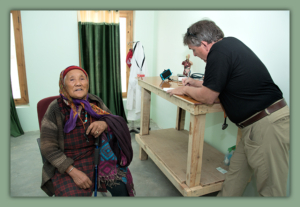 Satellite teams travel to remote village areas to see those unable to walk to the hospital. Each year we build on our camp as we identify the needs of the population. This year’s camp was amazing. Our USA team was again joined by providers from Brazil and our faithful team of Zanskaris. 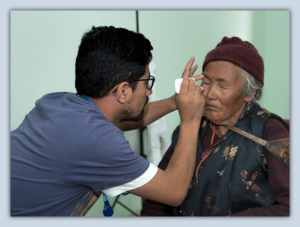 We treated over 2340 patients in less than 3 weeks. 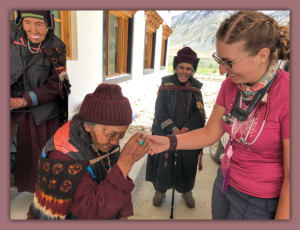 The team provided basic medical care, cervical cancer screening, ultrasound, lab work, pre-natal care, massage, physical therapy reki, herbal and Tibetan medicine. 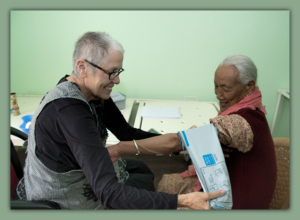 This year we were able to do 4 village outreach programs which were a huge success. 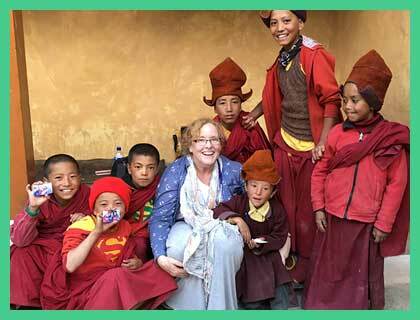 There is magic to this project; of course Zanskar is a magical place and we are there at the request of the Dalai Lama. 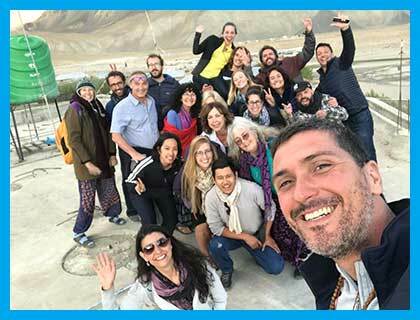 The team worked hard and in their off time visited many beautiful monasteries, villages and even rafted the Zanskar river! The community of Ufti held a party for us where we were dressed in traditional clothing and served a traditional feast. There was much dancing and singing and exchanging performances. We were aided by the local brew, CHANG. They made us feel at home and a valued part of their community. And we will return for year 4. This is the land of the last authentic Buddhist culture, isolated geographically by the rugged high altitude Himalayas and harsh weather conditions. 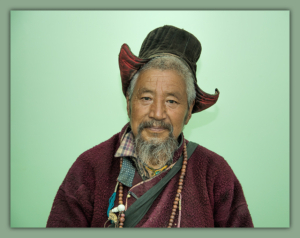 Politically, it is a minority Buddhist culture within a Muslim state.The culture is in jeopardy as the Buddhists struggle to maintain their simple mountain lifestyle. Their numbers are diminishing and they face dire environmental challenges due to global warming. 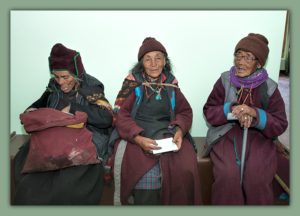 Basic health care is an issue in their sustainability as a culture. There are many challenges to health care delivery and we learn about these challenges more and more every year. This year we brought a microscope and were joined by a Brazilian biologist. 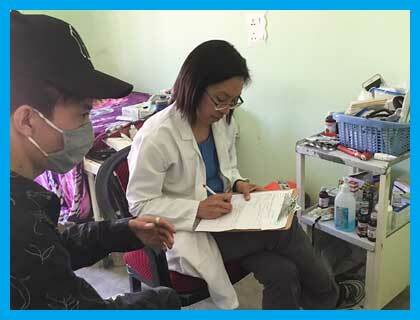 Water samples were analyzed and we tested people for ova and parasites. Not surprising we discovered we NEED TO ADDRESS THE WATER. Already we have an engineer working on it but we will need help and FUNDS. 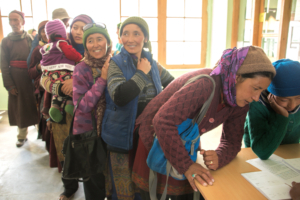 This year we were able to work more closely with the government pre primary clinic in Padum. 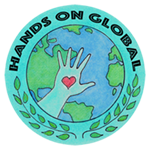 We asked them specifically what was most needed and where we at Hands On Global could be most beneficial. Their request was for endoscopy because there is so much gastric illness. We are looking for funds to purchase the equipment but most important an endoscopist who could join us and teach for 2-3 weeks. Another need we have identified is in the improvement of OBSTETRICS. There are midwives who monitor pregnant women but they have limited training. There is a delivery room at the pre primary clinic but it is shockingly lacking in equipment and supplies. Midwives do the best they can. This year during the 18 days of our medical camp there were 3 cases of fetal demise in late term pregnancies. There are many stories of stillbirths. We want to change this by continuing to provide education to the midwives and we would like to take it a step further by providing needed equipment and supplies to improve the delivery room.